The GPS antenna will be located on top of the fuselage and comprises a very small antenna hardly visible between the many other antenna’s. The antenna is active (Low Noise Amplifier (LNA) included) to compensate for the coax cable run to the MMR. The LNA will be powered through the coaxial centre conductor also carrying the rf-signal to the receiver. Early GPS installations consisted of a self contained GPS receiver located in the crown/ceiling of the aircraft close to a passive GPS antenna on top of the fuselage. This type of installations is referred to as the Global Navigation Satellite Sensor Unit (GNSSU). This type of installations has been terminated. Unique architectures may locate a GPS receiver as an integral part of a Flight Management Computer System (e.g. B747-300 FMCS) or the Enhanced Ground Proximity Warning System (EGPWS) in retrofit installations without a MMR. With electrical power available and the circuit breaker closed, the GPS receiver is operational and will provide output without further controls. Time-To-First-Fix (TTFF) may be reduced by supplying present position as an initialisation input to the GPS receiver. This PPOS may be derived from the aircraft IRS or memorized by the GPS from the previous flight. 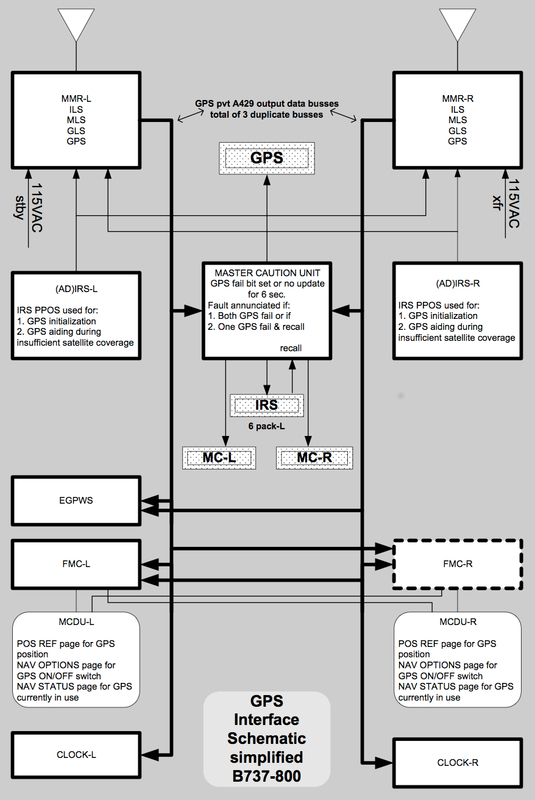 The same IRS input may assist the GPS receiver to coast through short periods of GPS signal loss speeding up re-acquisition. Once available, the GPS position may be used as an IRS alignment PPOS input to accurately align the IRS’s without reference to gate positions or equivalent. The GPS receiver has the regular Built In Test Equipment (BITE) and will annunciate receiver failures through amber annunciator(s) and/or messages on the applicable aircraft warning and caution systems. Faults may also be indicated when GPS navigation is lost for 6 seconds. There are hardly any normal or abnormal procedures for the pilot to mention. GPS operation basically is fully automatic. The only control provided may be a GPS manual inhibit prompt on the applicable FMS CDU page (NAV OPTIONS) to disable the system e.g. if behaviour is unacceptable or when NOTAM’s indicate unreliable GPS signals part of the route. Even then, the FMS navigation sensor logic should be able to automatically deselect GPS data if it no longer fulfils the FMS specific requirements for primary use and FMS reverts to DME/DME, VOR/DME or IRS only navigation, whatever is available. GPS will prove to be the most accurate latitude/longitude position sensor and the number of so-called MAP-shifts will reduce significantly. In combination with the EGPWS terrain database the accurate GPS position will reduce the CFIT risk. Accurate UTC derived from GPS will aid the increasing demand for Required Time of Arrival (RTA) operations leading to reduced separation minima. More specific information related to specific aircraft installations can be found in the applicable Aircraft Operations Manual (AOM) including procedures for use and limitations. The schematic shows a typical aircraft installation (B737-800).